I have joined the talented Stampin' Up! Blog 'N Hop group for another round of inspiration this month. I reside in the US and my location is ever changing as I am what is known as a full time RVer (travel around in a trailer). I love to share my passion for papercrafting everywhere I go! 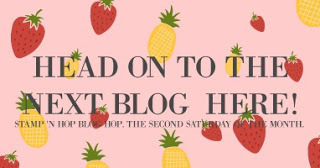 I hope you enjoy my project and are inspired by all of this blog hop's awesome creations. This month the hop group is celebrating our favorite annual catalog products. There are so many to choose from, so I focused on mother's day which is coming up in the US early in May. You cannot go wrong with a floral card for any mom. I chose the Beautiful Bouquet bundle. I inked the flowers with a range of bright colors as follows: Melon Mambo, Tangerine Tango, Daffodil Delight, Wisteria Wonder, and Pacific Point. The stems are Wild Wasabi. I then arranged the bouquet in layers, adding pearls to the centers and then placed them on a 3" circle die cut with a thin scallop of Wild Wasabi cardstock. 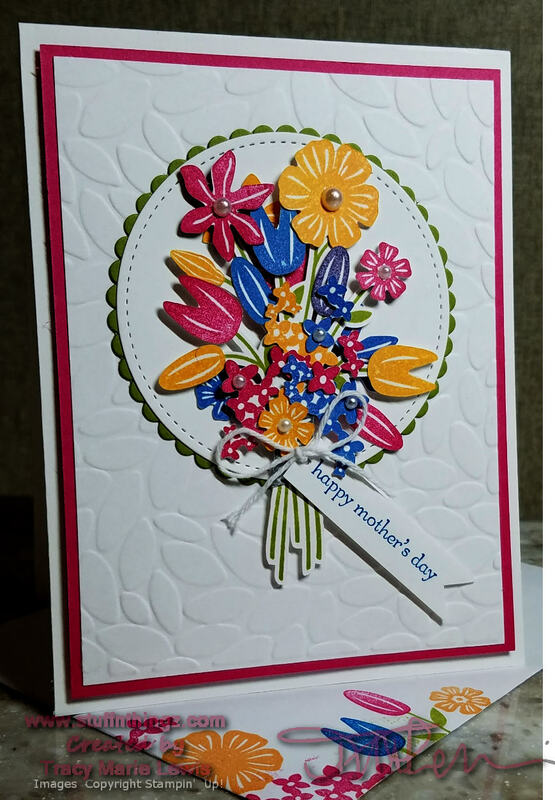 The background is embossed using the Petal Passion embossing folder. I made a tag and stamped the sentiment "happy mother's day" from Teeny Tiny Wishes. I tied the tag on using a snippet of white baker's twine I had leftover from a Paper Pumpkin kit. I love my extras stash that is always full of options thanks to Paper Pumpkin. Alas, Wild Wasabi and Teeny Tiny Wishes are being discontinued and are only available while supplies last, or in the case of the stamp set all orders through May 25th will be filled. If you do not have a demonstrator and need any assistance with ordering these or any other retiring product, reach out to me I am happy to help in any way I can. The background was trimmed to 3 3/4" x 5" with a 1/8" Melon Mambo mat. I popped up the matted background using dimensionals. And now back to the top of the list - Kayla Adams! Love these colours and so pleased this set is staying. The replacement for Teeny Tiny has nice fonts too so something to look forward to. Wow! what a great card and so bright and colorful! I know your mom will love it! It's refreshing to see such cheery colours with the winter we're still getting in Ontario! Wow, Tracy! What a bright and fun card! Love all the colors and texture! Love the bright and cheerful colours - TFS! Gorgeous card! The colors are so bright and cheery. I was so sad to see that Teeny Tiny Wishes is being retired. I think I've almost worn out my set from the many, many times I've used it! Such a bright and pretty card! Perfect for Mother's Day.